Sixty-five years ago today I came into this world. According to my mother it was around 6 in the morning but then there have been other times when she thought it might have been around 3 in the afternoon. I guess when you have had six children a few little things may be hazy after 65 years. Regardless of what time I originally arrived I’m here now. Traditionally I celebrate two birthdays. This one, the day I actually entered this world and again July 2 which was the day, in 1953, that I received my polio diagnosis. That represents the birth of the person I am today. After 65 years I believe I can contribute to a few life lessons here. A life lesson is a lot like advice minus the old adage “Advice is the easiest thing in the world to give but the hardest to take”. Therefore I don’t call this advice, it’s a lesson and what you do with it is completely up to you. That leads me to the first lesson. Be cautious on who you enter an important philosophical debate with. The issue may be very important to you but nothing more than a vehicle for someone else to try pushing your buttons. That is not to say don’t speak up for those things that are important to you but be aware of your audience. I have created so many levels of frustration for myself because I didn’t realize the individual I was talking with didn’t give a damn about the issue. They had no interest in hearing what I had to say, they had no desire for any type of resolution or in working towards a solution. It’s a competition for them and has little to do with the issue. Like any competition this is all about control, someone attempting to take control of your feelings by saying or doing whatever they believe will get you so upset you forget about logic. They want to trigger your emotional responses and could give a damn about having a logical debate. Once it becomes a competition the objectivity is gone and, if you bite, you have given control to someone else over your emotions. Emotions are fine but they don’t win arguments, don’t give someone else control over yours. And always keep in mind, conversion is not necessarily the end game. The defence of ones belief system, whether or not you agree with it, should be the backbone of our democracy (as long as those beliefs don’t involve wearing white sheets, masks and doing serious physical harm to people). It is fine to agree to disagree! 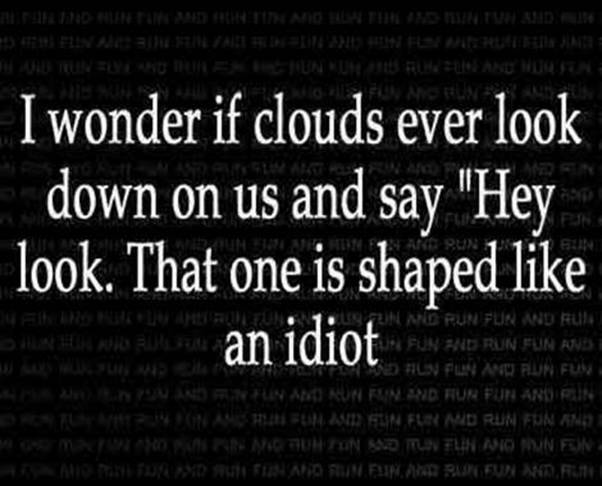 I have a whole cloud bank watching people around me! In my political dealings I find more often than not this approach is coming from an ideological point of view where the ideology is so rigid it’s unbendable. If they can’t agree to disagree, it’s time to walk away. To maintain the discussion just makes you another ideologue. Know when to walk away before you say something you will later regret. Lesson two (and this one took me a while) stop making a priority out of people that consider you an option. Real friends know this which is why it is so important to differentiate between friends and acquaintances. I realized I had lots of acquaintances but the number of friends was actually pretty small. Life isn’t always about quantity but more about quality it. It’s a much nicer place to be when you have a few very close friends that respect and trust you than dozens of acquaintances you only see a couple of times a month. Quantity is fun but quality is more appreciative and respectful. It’s easier to feel really good when you know it is respect based. If your respect has been earned you should be past the point where making them a priority maintains you as you an option. If you are feeling like an option then get them off your priority list. You disrespect yourself by allowing people to treat you that way, at least that is my feeling. If you can’t treat yourself in a respectful manner how can you expect others to? Both of these lessons have something in common. Ultimately you are responsible for yourself. You chose to let others control your feelings and you chose to let people disrespect you. You don’t need to be obnoxious or disrespectful to make people aware of how you are feeling but you do need to take ownership over the end result. Anyway those are two simple life lessons by someone way past their best before date. I’m 65 today and was never suppose to make it here. Up until my 30th the belief was persons with disabilities didn’t live much more than 30 years post disability. Well health care and technology have really changed that one so now I am part of a generation that got somewhere we were never suppose to. In closing, after five years of doing this, I have added a “Donate” button to my site. If you think you get your 25 cents worth here feel free to make a small donation. My annual renewal costs are coming up and I have to pay for this somehow. If you can’t don’t sweat it. See you next time and watch for me on my Ustream podcast channel. This entry was posted in Disability, Personal Life and tagged accessibility, independent living, life in a wheelchair, life lessons, personal blogs, Terry Wiens. Bookmark the permalink.